thyroid Archives - Dr. Nikolas Hedberg, D.C. In this episode of The Dr. Hedberg Show, I interview Melissa Gallico about fluoride. We talked about where fluoride comes from, why it was added to our water supply, how to know if your water is fluoridated, how to filter fluoride, other sources of fluoride, the fluoride-acne connection, the fluoride-thyroid connection, how to detoxify fluoride with iodine, and how to petition your local legislators to remove fluoride from your water supply. I was not aware of the fluoride-acne connection so this was an enlightening podcast that everyone should listen to who has acne or a thyroid issue. In this episode of The Dr. Hedberg Show, I interview Dr. Izabella Wentz about her new book, “Hashimoto’s Food Pharmacology.” We had a great talk about Hashimoto’s disease, Dr. Wentz’s Hashimoto’s healing journey, foods that can help heal Hashimoto’s disease, green smoothies, bone broth, and some recipes that can help heal Hashimoto’s disease. I highly recommend all of Dr. Wentz’s books and her new book will help you make food easier and healthier so you can heal your Hashimoto’s disease. In this post I’ll cover everything you need to know about ferritin and hypothyroidism. The ferritin test is a simple blood test and it is one of the most important tests you should have if you have Hashimoto’s disease, Graves’ disease, and hypothyroidism. Ferritin is a storage form of iron and the ferritin level test can tell you if your iron stores are low and need to be increased. The ferritin test is rarely ordered by conventional doctors so many patients are left with the signs and symptoms of hypothyroidism when it is actually their low ferritin levels that are causing their health problems. The first issue with iron is that iron deficiency may be quite severe but blood markers such as hemoglobin and the red blood cell count may be normal. This leaves many patients, especially women, misdiagnosed as not having anemia. One of the main priorities in my practice is to stay on top of the latest cutting-edge research in Hashimoto’s disease and thyroid disorders. My latest round of research reviews involved six clinical studies that examined inositol and selenium and how they conferred major benefits in those with Hashimoto’s disease and subclinical hypothyroidism. The highlights of each study are summarized in a table at the end of this article for ease of reference. Can Genistein Help Heal Hashimoto’s Disease and Hypothyroidism? In the fall of 2016, a study was conducted in China and published in the medical journal Immunobiology. The researchers looked at the compound genistein and Hashimoto’s disease to see if it affected thyroid function in patients with Hashimoto’s thyroiditis. The research paper was entitled, “Genistein improves thyroid function in Hashimoto’s thyroiditis patients through regulating Th1 cytokines.” To clarify, “Th1 cytokines” refer to a type of thyroid-helper cells that indicate how much inflammation there might be in the thyroid gland. In other words, they are markers of inflammation. The results of this study were very exciting so you might want to pay close attention. 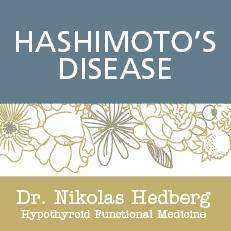 In this article I cover Hashimoto’s thyroiditis natural treatment including some basic supplements that can help heal Hashimoto’s disease and hypothyroidism as well as some dietary strategies. Let’s talk about each nutrient that your thyroid needs and how to find out if you are deficient. It may be that you would benefit from some simple supplements for Hashimoto’s thyroiditis and hypothyroidism. What is the Best Diet for Hashimoto’s disease? Does a low-carbohydrate diet work best for Hashimoto’s disease? What about a gluten-free diet? There are a number of diets out there claiming to be the best for Hashimoto’s thyroiditis but as with any condition, there is no single best diet for everyone. I’ll cover two research papers that look into two specific diets for Hashimoto’s disease. Does Vitamin D Supplementation Help Heal Hashimoto’s Disease? Is There a Connection Between Vitamin D and Hashimoto’s Disease? Does Vitamin D Supplementation Help Heal Hashimoto’s Disease? Vitamin D has long been established in literature as a highly essential nutrient with benefit to the musculoskeletal system and bone density. It also functions in the body as an immunomodulator, facilitating normal immune system function and improving resistance against certain diseases. Given this background, one has to wonder if a deficiency in vitamin D would be prevalent among individuals with Hashimoto’s thyroiditis and if so, would supplementation with vitamin D help patients manage the disease or perhaps even prevent it? I was pleasantly surprised to learn about some recent research on the positive effects of black cumin seed oil and Hashimoto’s disease. I’m always searching for compounds that can help my patients with Hashimoto’s disease and black cumin seed oil looks like a real winner. In this article I break down two promising studies on black cumin seed oil and how it can help autoimmune thyroiditis. Aloe vera is one of the oldest medicinal plants we know of that was used by the ancient Egyptians who called it “the plant of immortality.” And 200 years ago Greek scientists considered Aloe vera a “universal panacea.” Aloe vera is technically named Aloe barbadensis and you most likely have heard of using Aloe topically for burns or internally for soothing an inflamed gut. I’ve used Aloe vera over the years as one of the compounds in a gut-healing supplement I use for leaky gut, inflammatory bowel, SIBO, constipation, and irritable bowel syndrome. It works extremely well at reducing inflammation and repairing inflamed and damaged mucus membranes in the gut and the urinary tract. I have also used it quite successfully with the bladder pain caused by interstitial cystitis.